180 designers set out to make a unique tagger kit, with 1 common color scheme. The result was the LARGEST tagger collab in HISTORY! 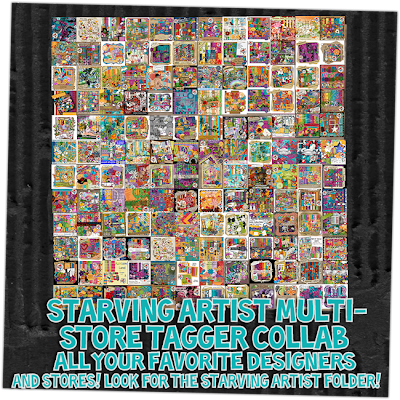 Just look for the "Starving Artist" collab folder! A list of stores are provided as well as a list of designers. Be sure to check them all out to get one heck of colorful, unique tagger MASSIVE collab. Low introductory rate per kit! Check out the blog to find your favorite store & designers! And to get a peak at their kits!!! Wow the designers have gone nuts They are having a valentines day sale with discounts from 50% off to .25cent kits. This sale will only last until Feb 16th so come on in and shop till you drop. You will be amazed at all the new kits added in the last week. 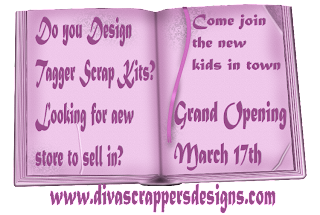 The Ladies have been super busy bringing you new and wonderful Kits and supplies.